Your child deserves the best and nothing less. So, if you are thinking of buying a ride-on car, you should get them nothing but the best. But, how easy is it for you to find the best ride-on car? There are so many options for you to choose from. Not as easy as you thought, right? Well, we have some great options for you. We have gone through an extensive list of ride-on cars and we have come up with what we think are the best of the lot. With a wide range in prices, we are sure that there is a ride-on car in this list that will meet your budget. Make sure that your child can fit comfortably in the ride-on car. Their legs should not be touching the steering wheel and they should be able to touch any pedals present. Not all ride-on cars are made for all ages. Find something that can be used for your child at their current age. Some ride-on cars are operated by battery and some are operated by pushing or pedaling. Whatever you choose is based on your preference and what your child would love. Look for things such a seat belts, brakes and other features that can keep your child safe. Make sure that your child won’t topple over while operating the toy. Some inferior versions are not very balanced. 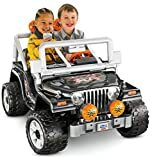 This very realistic looking Jeep Wrangler ride-on toy has a Frozen theme, hence its name. It is a very colorful toy that would be suitable for children who love the movie Frozen. Suitable for children aged 3-6, this is the best colorful ride-on car, hands down. If your child cannot stop singing all those lovely songs that were in the Frozen movie, we are sure that they will love this toy. The doors open and close easily for a child to get in and out, and there is a storage area that is quite large. Your child will be able to take carry many things along with them when they ride in this car. This toy is very safe as it does not have sharp edges, and there are 2 speeds that your child can use when driving or reversing. If you are not sure how your child will maneuver this toy or you have other safety concerns, you are able to lock the second speed so your child can only drive at the lower speed. The braking system in place ensures that the ride-on car can stop very quickly if necessary which is another great way to ensure safety. Since this toy can move in all directions, there are no limitations to your child’s driving. In fact, we think that this feature will make them love this toy even more. Is your child in love with the color red? Does your child love trucks? If yes, this is a great toy to purchase for your child. This amazing ride-on car is quite reasonably priced and it has many features. It has an extremely realistic look that we are sure your child will love. 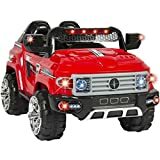 Complete with multicolored LED lights on the border of the windshield, headlights and side mirrors, this toy car is quite stunning. While driving, this ride-on car can play up to 6 different songs to entertain your child and there are 2 speeds included in this toy. If you want more music, there is an AUX cord that you can use to increase your music options. If you are not very confident in the driving skills of your child or you want to control the movement of the ride-on car, you can simply use the remote control that it comes with. Otherwise, your child can just use the foot pedal to control the toy. Safety is not a concern for your child in this toy since it comes equipped with a seat belt and it does not have sharp edges. This is the best ride on truck that we have come across—it even has a horn. It is designed for children aged 3-5 and it has a weight capacity of 77 pounds. Recommended for children 3 years and older and with a weight limit of 130 lbs., this GMC ride on truck is fabulously equipped with features that any child would love. It has a high-speed lockout so you can stop your child from going at the higher speed, which is 5 MPH. Since there are only 2 speeds on this ride, once you activate the lockout, your child can only travel at 2.5 MPH. The toy has LED highlights that actually work, plus horn and engine sounds for a more realistic ride. The doors can open so your child can easily step inside and there is even an MP3 connector for you to personalize the music that is played inside. This is the best realistic ride-on car that we have come across. It has very realistic features so your child can feel as if they are driving an actual vehicle. You do not have to worry about buying expensive batteries for this toy either. It has an external charging port for charging its battery which has a battery life of up 12 hours. However, batteries are required for steering wheel sounds and these are not included in the package. This very pink ride-on car is made to be used by only one child. Although we consider it to be the best ride-on car for a toddler girl, it really can be used by any gender. 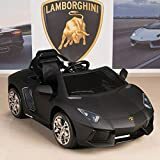 It is just about perfect for children aged 2- 4 years and it can be operated by using the foot pedal and steering wheel or by the remote control which is included in the package. This toy has a very beautiful design and its LED lights plus engine sounds definitely make it seem very realistic. There are 2 speed options for this toy and it can move forward, backwards, left and right. This ride on toy comes equipped with an AC charger so you do not have to purchase batteries for it to be operational. This is great since battery replacement costs can be quite high for a toy like this. The battery life is up to 2 hours on a full charge. To ensure the safety of the child, there is an adjustable seatbelt so they can be strapped in. If you are looking for the best monster car, this is it. This Fisher-Price toy has a great build and can be driven on various types of terrain because it has such amazing traction. It has 2 speeds for driving forward, but can only go backwards in the lower speed. There is a power lock brake system for safety, and there are sidebars for hand support. It can seat 2 children and has a maximum weight capacity of 130 lbs. 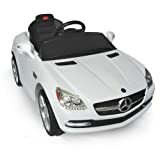 If your child will be riding in this car, there is no need to worry about their safety; there are no sharp edges so your child will not receive scratches or cuts. To add to all these great features, you do not have to worry about stocking up on replaceable batteries. The toy comes with a rechargeable battery and the charger required to maintain its charge. When you purchase this ride-on car, you will have a bit of assembly to do; however, the instruction manual clearly outlines how you should assemble the parts and all the tools needed for the job are included in the package. With this toy, your child can really experience the joys of a high-end ride-on car. This is one of the best ride-on cars that you may ever come across. Although it has quite a hefty price tag, it has a lot of awesome features that we are sure both you and your child will love. The overall design of this toy is fabulous. It has a very realistic look and it is more than your average ride-on truck. Because of its large wheels, this ride-on truck can be driven on a variety of terrains. To make this toy even more fascinating, the manufacturers have included a dump bed that can operated manually and a tailgate that can be opened and closed. Both doors on the truck can also be opened and closed so your child will have a more realistic feel when entering or exiting the toy. To operate this truck, all you need to do is ensure that you charge the rechargeable batteries that are included in the package. 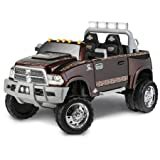 You won’t need to spend additional money on batteries with this toy truck so the high price tag is worth it. It even has LED lights for a more realistic feel. This toy car can drive at 2 speeds but can only reverse at the lower speed. This is a great way to ensure the safety of your child since many children may not pay attention to what is behind them. Once you purchase this item, you should receive a 12-volt battery in the package along with the corresponding charger. There will be no need to purchase replacement batteries for a long time. If you have 2 small children, you will be happy to know that this toy can fit 2 children at once but it has a weight limit of 130 lbs. This ride-on car has a remarkable design and looks very realistic. It can be controlled 2 ways—via the steering wheel and pedals in the toy, or by the remote control that is also included in the package. 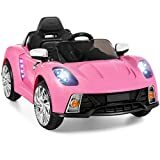 There are also some realistic sounds that have been prerecorded and added to the toy plus MP3 connections so you can choose which music to play while your child drives around. The speed on this toy car goes to a maximum of 4 MPH and it is recommended for children that are 3 yrs. and older. It can only fit one child and can support up to 55 lbs. When the battery goes dead, you do not have to worry about spending a fortune to replace it since it is rechargeable. Available in 2 colors, this ride-on car is the perfect toy for any child weighing up to 65 lbs. Because of its heavy-duty design, your child can drive this toy on smooth as well as rough terrain. The toy cannot drive at great speeds, which should be quite comforting to parents since you can rest assured that your child will remain safe. This product is suitable for children aged 2-6 years old and it can only fit one child. 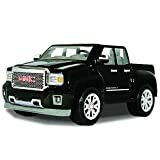 To make this ride-on truck more realistic, the manufacturers have placed a replica of an engine under the hood and your child can open the hood to see what’s inside. The truck bed is also very roomy so your child can carry toys or other items in the back. Mimicking a high-end luxury vehicle, this ride-on car has been elaborately designed. For instance, it has 3 speeds—2, 3 and 4 MPH while going forward. This way, your child can control just how fast they go while driving. There are even front and rear lights to enhance visibility although they are mostly there to give a more realistic feel of a car. It is equipped with a seatbelt and has a weight capacity of 66 lbs. When you purchase this product, you will not have to do a lot of assembly; in fact, only 5% of this product will require assembly. It is perfect for children 2-4 years old and it can fit 1 child.